Chris Connolly (L), Roadtec national sales manager, east, congratulates Tim Albright, Columbus Equipment Company vice president, sales and marketing. 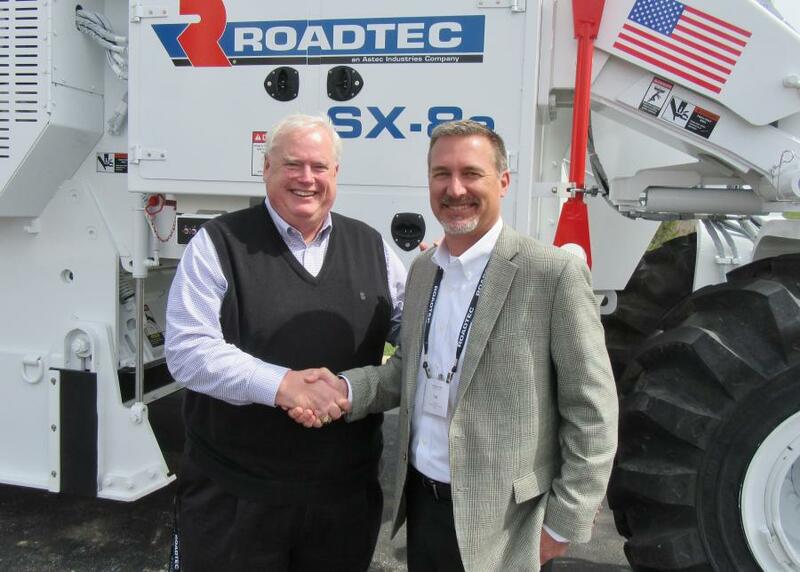 Roadtec welcomed Columbus Equipment Company as a new dealer to its growing network. The dealer expands the availability of Roadtec's complete line of road construction equipment. Columbus Equipment serves Ohio with 10 locations across the state. Each location will have the ability to sell and service Roadtec pavers, cold planers, material transfer vehicles, stabilizers and brooms. The dealer also will be able to rent out equipment to the market. In late 2015, Roadtec began the process of finding qualified dealers in select markets to help the brand better reach road builders throughout the United States. The Chattanooga, Tenn., based company plans to maintain a full factory-direct sales team, which will remain accessible to all customers and owners. The growing dealer network will supplement sales and service for Roadtec machinery in areas that are historical opportunities for the brand. In addition to new equipment offerings, Columbus Equipment will stock a full supply of wear parts, maintenance items, and all other matters needed to support customers with timely service, which contributes to minimizing downtime and building overall customer satisfaction.